The University has awarded seven public engagement with research grants to support staff and postgraduate students with the delivery and promotion of their projects. Staff and postgraduate research (PGR) students were invited to apply for a University grant of between £200 and £2,000 earlier this year. The seven successful applications were selected from research programmes that made strong offers for a variety of impacts and public benefit. 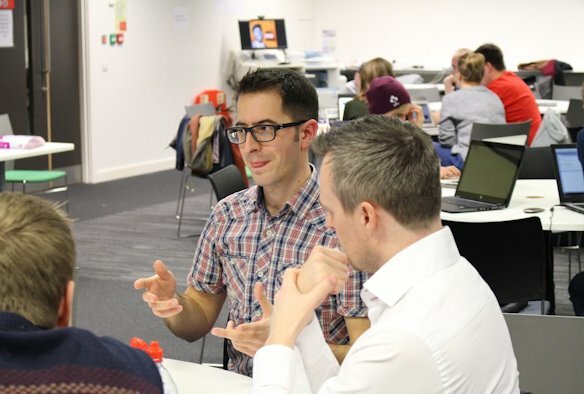 Dr Robert Treharne (pictured), School of Physical Sciences, to further develop the Hello Python project (HiPy); a grass-roots, student and researcher led initiative facilitating the learning of coding skills within a wide variety of community, educational and public settings. Dr Daniel Pope & Dr Sara Ronzi, Institute of Psychology, Health and Society, who’s public engagement initiative will work with communities and policymakers to improve health outcomes and livelihoods of economically disadvantaged women and children in Cameroon. Dr Iain Young, Institute of Integrative Biology, is working with Farm Urban and Squash Nutrition to deliver an innovative Aquaponics in the community project. This work will see an aquaponic installation engaging local people with the latest sustainable growing technology in the new Toxteth Food Central (TFC) community hub. Dr Rebecca Greenaway, School of Physical Sciences, will use her grant to support her exhibition Molecular Cages – The Hole Story, at the Royal Society Summer Exhibition. Pauline Rowe & Dr Lauren Elkin, School of the Arts, are working with Open Eye Gallery. The Photography & Poetry project will seek to explore new opportunities for poets and photographers to work in collaboration, as well as to promote interdisciplinarity, creativity and innovative thinking about how language and image can combine in new work. designed to provide flexible financial support for researchers engaging with individuals or groups outside of academia. The scheme is expected to continue beyond this pilot, with the next call for applications to the fund is anticipated to be February 2018. Professor Dinah Birch, Pro-Vice-Chancellor for Research and Impact, said: “Public engagement is not just an add-on activity; it is fundamental to our work. The engaged approach enables us to extend our reach and increase our impact, and provides our students and staff with a range of distinctive opportunities to excel.